I have been quite out of the loop here, haven't I? For my regular readers, please accept my apologies for being so MIA this fall! I definitely need to get into a better routine of writing on the reg! Despite the appearance that I've gone MIA, I've actually been putting in a number of hours and days and weeks devoting to planning lovely brides' weddings, meeting with new and potential clients, and getting ready for the amazeballs year ahead of us. 2013 was quite the building year! Going from launching the official start of Kelly Dellinger Events to booking significantly more clients, learning the ins and outs of business operating, deciding whether or not I'm cut out for this whole entrepreneurship thing (turns out, I am! ), debating about taking a full-time job outside of KDE (turns out, I won't!) … there have been ups and downs all over the place over the past calendar year. I believe in being transparent, hence me telling you all of these not-so-gung-ho bits about business ownership. It's hard, y'all! There were a LOT of days where I stomped my feet and asked God to PLEAAAAASE reveal His plan for me in this business, so I could know whether or not it was all for naught. He continued to tell me to be patient. Patience is not one of my amazingly strong virtues or spiritual gifts, lemme tell you. But it was my calling. Wait through the storm. You'll come out on the other end stronger. Do I feel like I've suddenly "made it" or found the ultimate source of business success? Um, no. But do I feel like I'm living in alignment with God's plan for my career right now? Yep. 2013 was for building. Setting a foundation. Working with a bunch of wonderful clients with gorgeous tastes, styles, preferences. Getting to know different personalities. Learning how to work in difficult situations. Continuing to build my personal event planning skills. Sharpening my styling abilities. I've learned so much this year. Basic business practices. How to literally pay business taxes (note: some government workers can seem really mean and condescending with new business owners). How to network. How to push through fear. I've drank so many cups of coffee and glasses of wine this year. (Don't worry, Mom, it was mostly coffee.) I've cried so many tears. Sweated. Blown my nose. Nursed sore feet. Building years can be really rough. But has it been worth it? Oh, oh yes. For every few stress-induced heart palpitations there has been a sweet word from a client (or her previously temporarily-crazy mom). Or a late-night meeting where I leave and call my husband to tell him, "I really love my work!" There always seems to be a venti chai tea latte when I so desperately need it. Or a solid event assistant who is worth her weight in gold. I can be burnt out and feeling completely uninspired, and yet someone will come to me with a spark of an idea that we run away with (like unicorns under a rainbow of glitter sugar sprinkles into the sunset). God gives us exactly what we need, when we need it. Always. He is so faithful. My fall 2013 mantle -- complete with gourds aplenty, softly glowing candles and a couple of romantic touches. It may or may not have been replaced yesterday by a verrrrry early Christmas display. "the importance of prior planning" & "organization overhaul"
My mother always asked my sister and me, "How do you eat an elephant?" While neither of us ever thought it sounded all that appealing to eat an enormous, tough-skinned beast of a creature, the answer we'd drone back to her ("One bite at a time...." [insert teenage angsty sigh]) was true with most endeavors. In my adult age, I'm still struggling to implement that lesson into my own daily life. I take on huge projects and then PANIC at the thought of getting everything done in order to accomplish them. I love instant gratification, but as I've grown, I've come to learn that quality is far more important in the long run. Staying power is more important. What's the point in implementing some quick-fix system that leaves you at Point A all over again a couple of days later? This is true in life and in work. Procrastination comes hand-in-hand with "instant" gratification. If I'm panicked over a project and want it to just be done with a quick fix, I typically put it off until the last minute. And then I have no choice but to solve it in the heat of the moment and then what's done is done. Now, don't get me wrong -- this personality characteristic can be really wonderful in event planning. It can be just as much a strength as a weakness. When it comes to a client's wedding day, I have no choice but to solve problems on the turn of my heel, find immediate solutions, and implement and ACT at a moment's notice. For clients only get one wedding day. Events only happen on Event Day. It's done, and it's over. BOOM. I don't have the luxury of knowing days or weeks in advance whether a car accident will happen outside of an event venue, rendering traffic immovable. All I can do is adjust the timeline, notify important parties who are traveling to the site about detours, and damage-control. (Perhaps cocktail hour will be moved to pre-ceremony time, so that the guests who are present can refresh themselves rather than waiting impatiently.) The instant gratification of an unexpected problem solved immediately is DESIRED. For me, the one area I tend to let slip the most is my home life. As much as I cringe to say that out loud (YIKES), I have an unfortunate propensity to throw things about haphazardly, avoid finding permanent "homes" for possessions, and pretend like home organization as a whole is out of my skill sets. The truth is, I'm perfectly capable -- I just get overwhelmed, panic, and jump ship before I can get everything in order. Which means most of my efforts are in vain, because they can't be maintained for over a week. Talk about discouraging! So, I need to take the elephant-eating approach. One step at a time. One teensy area at a time. One home project, done extremely well (but not necessarily "perfect" -- since that's a cop-out too.... I'll never get this closet looking perfect, so why bother trying at all...?). Piece by piece. Room by room. Investing in necessary tools (like tubs and baskets), but also being resourceful and not wasteful with the things I already have. First up is our linen/coat closet. To give you an idea of what I'm working with, we live in a small apartment. 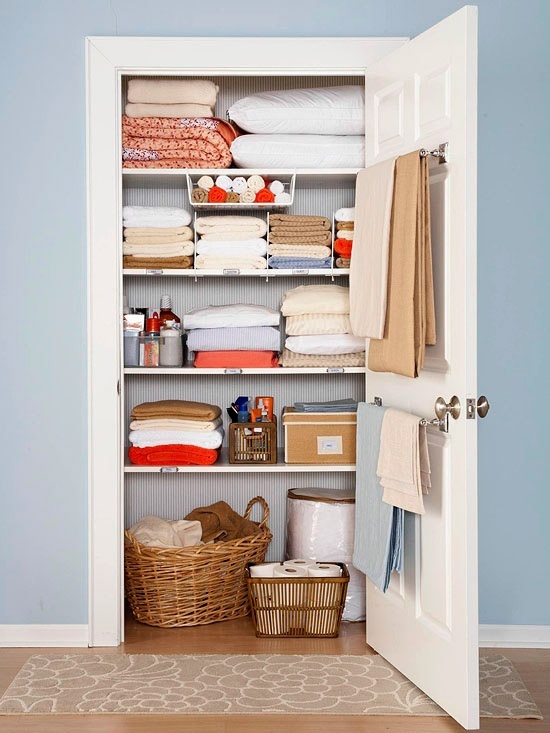 We have four total closets: three miniature, and one walk-in. Two mini ones are upstairs in my office area, packed to the brim with storage (computer boxes, holiday décor, random electronics Drew needs to go through at some point... etc). So we have one mini closet to use downstairs, and one larger closet for our actual clothing. In the past six months of living here, we've stuffed it full of random boxes, odd tool parts, tablecloths, suitcases, and every coat, hoodie, and jacket imaginable. But no more. I'm utilizing the vintage luggage set I have as actual storage containers, labeling them (so I don't forget one's stuffed with books from our August move, like I found out Friday night) with Post-Its, and hanging only the most important coats (so we have room for any overnight guests to put up their things -- and aren't humiliated showing off our ugly crazy closet). The linens will get moved to clear plastic tubs and stored in our large closet, and we'll figure out the rest as we go.